Afghanistan has been at war for 24 years. The West's battle against the Taliban is only the latest of a series of conflicts the Afghans have suffered. Filmmaker Taran Davies and Walied Osman, an Afghan-American, set out to gain an understanding of how a generation of war has affected the Afghan people. From Queens, New York to the frontline in Afghanistan, Taran and Walied spend time with several Afghan families. 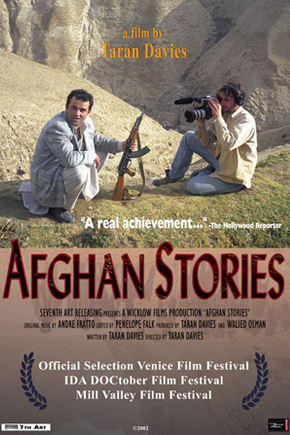 They meet a member of the royal family who was tortured by the Taliban, a doctor and journalist stuck in a one room apartment with their four children, a relief worker trying to rebuild his country one road at a time, a town elder who dedicated his life to peace and his warrior son who fought alongside the Soviets. Afghan Stories is not only an intimate and penetrating portrait of the Afghan struggle to survive, but a unique look at some of the challenges the Afghans face building a permanent peace. Taran Davies has produced and directed documentary films in Siberia, Central Asia, the Caucasus and Afghanistan. Taran's film The Land Beyond the River was the first feature length documentary shot entirely on Hi 8 to be premiered nationally by PBS in 1998. Taran has generally focused his camera on Islamic cultures and remote regions in conflict. He has explored the history of Islam, the roots of Jihad and the life of Muslims throughout much of the former Soviet Union and Central Asia. September 11th was a major turning point in Taran's career. He resigned his job in finance after the terrorist attacks in New York to dedicate his life to producing documentary films. He left for Afghanistan in early October to make Afghan Stories. Taran was determined to get behind the media stereotypes of Afghans as terrorists and fighters. 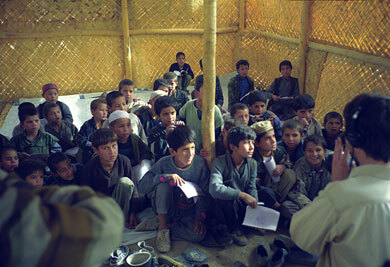 His goal was not the Afghan war, but the Afghan home. He hoped to give a voice to ordinary Afghans and learn how they have survived 24 years of war. Taran graduated from Harvard College in 1993 and is a member of the Explorers Club.